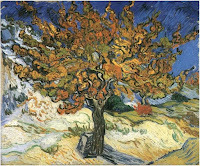 Celebrate Fall with your kids and Vincent van Gogh! 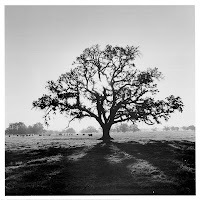 and compared it to Ansel Adam’s photograph “Oak Tree Sunrise” taken in 1966. We talked about van Gogh’s expressionist style and his wavy lines and brushstrokes he used in his paintings to give a feeling of excitement and movement. The students recognized that Ansel Adams tree looks calm and peaceful while van Gogh’s tree was “full of energy.” After our discussion, we began to create trees in the style of Vincent van Gogh. We discussed the difference between a wavy line and a scribble. A wavy line is a controlled, deliberate, well thought out line. First, we drew our tree in pencil, starting with the wavy trunk. Next we made a few branches, discussing how a tree branch looks similar to a letter “Y” with one long branch and a little shorter branch intersecting it. We made 5 long letter “Y” type branches. After the branches we drew our horizon line. The horizon line is where the sky and the ground meet. We looked at the Adams photograph to see how the horizon line is behind the tree. Lastly, we added the color with oil pastels. Kids love oil pastels! Kids can create bright, vibrant painterly like lines with oil pastels that is more difficult to achieve with paint. Each student added color using different sizes of wavy lines. We began with the tree trunk using various browns. Then we added the branches followed by the leaves. We used red, yellow and orange short wavy lines for the leaves. Finally, students layered various greens for the ground and blues for the sky.